This offseason, MiLB.com will be honoring the players -- regardless of age or prospect status -- who had the best seasons in their organization. We're taking a look at each team to determine the outstanding seasons in Minor League Baseball. Select a team from the dropdown below. The Reds took the Central Division title and made the National League playoffs for the first time in 15 years. Several prospects and recently acquired youngsters -- Drew Stubbs, Mike Leake, Chris Valaika, Aroldis Chapman and others -- made contributions at the big league level. And the Triple-A Louisville Bats won their third straight International League division crown. Not everything was positive, however. The Double-A Carolina Mudcats and Class A Advanced Lynchburg Hillcats finished last in their respective divisions, while the Midwest League's Dayton Dragons struggled through a 24-game home losing streak en route to a 53-85 finish. On an individual basis, stellar efforts by several prospects overshadowed win-loss records and made the season an overall success for Cincinnati. Catcher -- Devin Mesoraco, Lynchburg (43 games), Carolina (56 games), Louisville (14 games): Mesoraco, the Reds' first-round pick in the 2007 Draft, enjoyed a breakout year offensively. His defensive abilities already netted him two trips to big league camp in Spring Training; now his bat has caught up to the rest of his game. Mesoraco tore up the Class A Advanced Carolina League, hitting .335 with 10 homers, 11 doubles, 31 RBIs and a .414 on-base percentage in 43 games. Double-A ball barely slowed him down -- he swatted 13 homers and racked up 111 total bases in 56 games at Carolina. Although he batted .231 at Triple-A, he managed six extra-base hits, including a game-winning grand slam in his International League debut. His 26 longballs led all Reds Minor Leaguers. 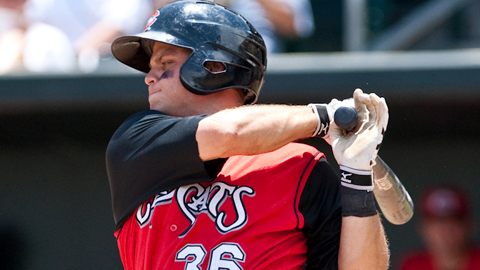 Honorable mention goes to 10th-round pick Tucker Barnhart, who hit .306 with a .412 OBP for Rookie-level Billings. First baseman -- Neftali Soto, Lynchburg (134 games): Although the Reds first base cup runneth over at the Minor League level (Yonder Alonso, Chris Richburg and Donald Lutz all received strong consideration), Soto had enjoyed a productive season. The 2007 third-rounder put on an impressive power display in the Carolina League while posting a .319 OBP. He was third in the circuit with 21 homers, adding 33 doubles and finishing with 73 RBIs and a .268 average. "He's thrown up some pretty good numbers," Hillcats manager Pat Kelly told the Lynchburg News & Advance in May. "We knew he was going to hit. He got off to a slow start here, but it's nice to see him get hot and stay hot." Second baseman -- Henry Rodriguez, Dayton (124 games), Lynchburg (six games): It's not every year a 150-pound second base prospect leads a Minor League system in RBIs, but Henry Rodriguez is clearly an uncommon talent. In addition to knocking in 82 runs, he was fourth in the system with a .305 batting average and third with 33 stolen bases in 46 tries. Although he moved up a level for the final six games of the season, he ranked second in the Midwest League with 158 hits. The 20-year-old Venezuelan played his first full stateside season in 2010. Cody Puckett, who batted .282 with 42 doubles, 18 homers and 18 steals across two levels, also bears mentioning. Shortstop -- Billy Hamilton, Billings (69 games): It's noteworthy that the player who led the organization in stolen bases turned 20 on Sept. 9. That he did it in a short-season league is even more impressive. The 2009 second-round pick stole 48 bases in 57 tries over 69 games for Billings. That total was more than twice as many as his next closest competitor in the Pioneer League, which he also led with 10 triples. And his .318 batting average ranked second in the organization. Hamilton also opened some eyes with his defense. After turning an unlikely double play to snuff a rally in the seventh inning of an Aug. 21 game against the Owlz, longtime Orem manager Tom Kotchman said, "That was a big league play. That was a Roberto Alomar-type play. You have to be some type of special athlete to make a play like that." Third baseman -- Juan Francisco, Louisville (77 games): Francisco appeared in 36 Major League games this year, hitting .273. His consistent production at the Triple-A level earns a spot here (although rookie Ronald Torreyes had a solid season). Francisco belted 18 homers and 24 doubles while legging out four triples and hitting .286 in at Triple-A. He also drove in 59 runs over 77 games. But he struck out 101 times over 363 at-bats across the two levels. "I am working on all aspects of the game and, of course, [cutting down on strikeouts is] one of my main goals," he told MLB.com before the season. Outfielder -- Dave Sappelt, Lynchburg (19 games), Carolina (89 games), Louisville (25 games): Sappelt's .342 batting average led the organization, and he proved a tough out at all three levels. He batted .400 during a 36-game on-base streak when he was promoted out of the Southern League in early August. "I did pretty good my first two years, but this is the best I've hit since college," Sappelt said during his outburst. The 2008 ninth-round pick hit .325 for the Triple-A Bats the rest of the season. He also totaled 25 stolen bases. Although Sappelt didn't make it to "The Show," Reds manager Dusty Baker made clear the team is aware of his exploits. Outfielder -- Yorman Rodriguez, Billings (49 games): In his second year as a pro, Stormin' Yorman Rodriguez hit .339 and drove in 39 runs over 43 Pioneer League games. He also stole 12 bases in 14 tries and scored 25 runs. Rodriguez was signed out of Venezuela last year and played 22 games in the Gulf Coast and Pioneer leagues in 2009. He turned 18 on Aug. 15. "The thing that sticks out, and the reason I fell in love with him, is his energy and how hard he plays," Mustangs skipper Delino DeShields told the Billings Gazette. "It's not that he hits home runs or that he has a great arm or any of that stuff. The main thing that got my attention about this young man was his passion and how hard he played the game." Outfielder -- Wladimir Balentien, Louisville (116 games): Balentien came to the Reds from the Mariners in a midseason trade in 2009. After playing 96 big league games last season, he spent all of 2010 at Triple-A Louisville. And he spent it well. Balentien was second in the Reds Minor League system and third in the International League with 25 homers while ranking second in the organization with 78 RBIs. He finished with 23 doubles, 78 RBIs and 71 runs scored, and his .536 slugging percentage also was second in the IL. Utility/DH-- Luis Terrero, Carolina (46 games), Louisville (30 games): Terrero, who played all three outfield positions and DH, finished with a .341 OBP, .515 SLG and 48 RBIs over 76 games. This was Terrero's 12th season as a pro, and his performance showed he can be a good option off the bench at any level. On May 11 with Louisville, he was 5-for-5, missing the cycle by a triple and driving in five runs. It was one of six multi-RBI games at Triple-A to go with seven at Double-A. Left-handed starting pitcher -- Tom Cochran Carolina (25 games), Louisville (1 game): After signing with the Reds out of an independent league, Cochran was a Southern League Pitcher of the Week, Midseason All-Star and Postseason All-Star. In 25 starts for the Mudcats, the 28-year-old ranked fourth at Double-A with a 2.69 ERA. He held opponents to a .237 average and yielded only 11 homers over 137 innings. "[Cochran is] durable and has good stuf," Mudcats manager David Bell told North Carolina's Independent Weekly. "He can get left-handers and right-handers out. He has a good fastball that's sneaky." Right-handed starting pitcher -- Jordan Hotchkiss, Lynchburg (31 games, 15 starts), Carolina (3 games): Hotchkiss started the season in the bullpen but was so crafty that the Reds converted him to a starter. The 24-year-old was taken late in the 2007 Draft, and he's overachieved in three of his four pro seasons. Hotchkiss, who didn't start pitching competitively until his senior year of high school, had a 1.57 ERA when the Hillcats gave him his first start of the season on May 29. Aside from five scoreless innings on June 2, he did not return to the bullpen the rest of 2010. He struck out 90 while walking 31 and going 10-4 with a 2.30 ERA over 31 Class A Advanced appearances, then was 0-1 with a 3.38 ERA in three Double-A starts. Foes hit .211 against him in the Carolina League, where he was named Pitcher of the Year. Matt Klinker also was solid in 28 appearances at Double-A and Triple-A. Relief pitcher -- Donnie Joseph, Dayton (19 games), Lynchburg (31 games), Carolina (seven games): Although Aroldis Chapman is clearly the most exciting addition to the Reds organization, Donnie Joseph's work out of the bullpen was sensational. The 2009 third-round pick, who doesn't turn 23 until Nov. 1, would have ended the season with an ERA under 2.00 had he not experienced some growing pains in seven Double-A appearances. He still wound up with a 2.08 mark and led Reds Minor Leaguers with 24 saves -- more than twice as many as anyone else. Over 65 innings, he struck out 103 and walked 25 while holding opponents to a .182 average. "Even when he falls behind," Lynchburg pitching coach Rigo Beltran told the Nelson County Times, "he finds a way to pitch out of it and come back and get the big outs."